Here you will find antique terms and meanings beginning with the letter ‘L’. From lace to Limoges and Leach to lustre as well as other related words and cross-referenced antique terms. Common Laburnum is a small deciduous tree (20 ft) introduced to Britain from the Continent. It is native to Central and Southern Europe. Scots Laburnum is native to the Alps and the mountain of Italy and the Balkans down to Albania. Laburnum has naturalised itself in various localised places in Britain. It is a hard, dense yellowish wood with variegated brown streaks. It was a popular choice for inlaid and veneered decoration, especially oystering after the Restoration, and for crossbanding at the end of the 18thC. 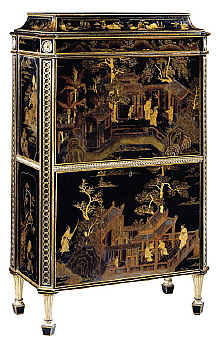 French term for Oriental lacquer work with mother-of-pearl INLAID DECORATION . Italian term for cheap, imitation lacquer, used on furniture in Italy, especially Venice, since the 18thC. Paper scraps or cut-out prints are stuck to the surface and covered in layers of varnish. 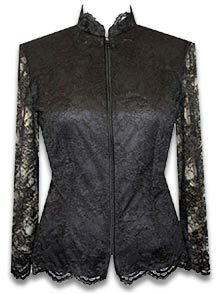 Lace is a lightweight, openwork fabric, patterned with open holes in the work, made by machine or by hand. The holes can be formed via removal of threads or cloth from a previously woven fabric, but more often open spaces are created as part of the lace fabric. Lace-making is an ancient craft. True lace was not made until the late 15th and early 16th centuries. A true lace is created when a thread is looped, twisted or braided to other threads independently from a backing fabric. Designs generally take the form of central motifs made up of numerous threads, several of which may be collected at the edge with a whipping stitch to create a ridged effect known as a cordonnet. The elements are joined either by slender threads known as brides or by a fine mesh, known as the reseau. Any additional decorative motifs used to replace the reseau are known as modes. Lace developed from an embroidery technique known as drawn thread work. Two distinct types evolved in Italy and Flanders (an area now mainly in Belgium) during the 16thC. In bobbin lace (also known as pillow or bone lace), threads attached to bobbins are intertwined to form the pattern. Needlepoint lace is sewn with a needle and a single thread, using embroidery buttonhole stitches. The various forms of needlepoint are often named after their supposed town or country of origin, such as point de Venise. However, point d’Angleterre is not, as the name suggests, English needlepoint, but a very fine pillow lace made in Flanders, notably Brussels, during the 17thC. Flemish and Belgian lace are often interchangeable terms although strictly speaking Flemish should be restricted to 18thC laces and Belgian to 19thC ones. Machine-made lace was a product of the Industrial Revolution. The net was machine-made and later hand-embroidered. The first machine-made net appeared around 1764. Chemical lace is an imitation lace produced in Germany and Switzerland in the 1880s. It is in fact a machine-embroidered technique identified by the soft, fuzzy texture of the design . Is glass decorated with a maze of thread-like lines resembling lace fabric. An example of lace glass is Fenton’s Spanish Lace Milk Glass. A very fine openwork technique for decorating porcelain developed in the 18thC, probably at meissen. A mesh-like gauze is dipped into liquid clay. When fired, the gauze burns away, leaving a hard skeleton behind. The technique was used on porcelain figures by many European factories from the 19thC onwards . Parisian firm of manufacturing and retail jewellers established by the four Lacloche brothers, 1897. The brothers originally made luxurious, Oriental-style enamelled jewellery, and in the 1920s adopted the art deco style . A hard, glossy, natural resin made from the sap of the Chinese lacquer tree. The sap is applied in thin layers – sometimes as many as 100 – to a base material, normally wood or fabric. Each layer is dried and polished before the next is applied. Eventually a thick, smooth surface is built up which can be dusted with gold or silver flecks or worked in relief. Colours, usually black and red, can be added to the opaque or transparent lacquer. Differently coloured layers were sometimes applied and topped by a black surface, so that various decorative effects could be produced by cutting through the stratified colours. This was known as guri incised lacquer, or coromandel lacquer or bantam work. In Japan a technique known as shibayama was produced by adhering pieces of mother-of-pearl, ivory and stones to a surface – rather like inlaid decoration – and then surrounding with lacquer. Small easy chair, with buttoned upholstery, introduced in the mid-19thC and often paired with a larger gentleman’s chair. The seat is deep and low, and the back inclined and high. There are both low-armed and armless versions. A bisque doll designed to look like an adult woman in face, figure and dress. see collecting antique glass – rene lalique. A design based on a pendent drapery effect. The word originally described a scarf worn across a knight’s helmet which was stylised in heraldic designs as the mantel around a coat of arms. In the latter part of the 17thC, the French applied the term to swagged or festooned drapery. The theme was adapted by furniture-makers and carved on picture and mirror frames. Around 1700, a lambrequin border pattern was developed for ceramics decoration at rouen in France, and was much used over the next 50 years. Style rayonnant is a variation in which the lambrequin motif radiates from a central point. A similar motif is seen on mid-17th to mid-18thC English silver cups. See decorative motifs . Glass shaped by heating it over a small flame. The technique is used to make small figures and ornaments . A spear designed to be carried by mounted soldiers. Although superseded by the sword and firearms from the 17thC, the lance was re-introduced by the French cavalry who adopted it from the Polish lancers during the Napoleonic Wars, and in Britain in 1816 . French cabinet-maker based in London c. 1760-70 and an exponent of Louis XV and Louis XVI styles. His commodes are noted for their fine marquetry decoration and gilt-bronze mounts, and a number of Adam-style card tables and pier tables are attributed to him . (1779-1819) French-born cabinet-maker who from 1805 was the leading furniture-maker in New York, USA. His work shows a delicate interpretation of the French directoire style, featuring Classical forms and motifs . The london and provincial antique dealers association, an organisation of antique shops and individual dealers formed to maintain standards within the antigues trade. Semiprecious, opaque blue gemstone containing golden flecks of pyrite (‘fool’s gold’). Method of finishing edges on metal ware by soldering thin strips of metal over them. It was used particularly for concealing the copper visible on the edges of sheffield plate objects. Yellowish to reddish-brown timber used for the carcass work of case furniture in the late 18thC. It is fairly hard and durable, but has a tendency to warp. Term used to describe glass decorated with a pattern of white, or sometimes coloured, threads of glass. Latticino is from the Italian for ‘milk’. The technique is also known as filigrana (thread-grained). It was developed in 16thC Venice and has been used to produce three main effects on glass: vetro a retorti, which has twists embedded in clear glass; vetro a reticello, which has a fine network of crossed threads; and vetro a fili, which has a spiral or helix pattern. German for ‘foliage and scrollwork’, a baroque-style framing motif similar to strapwork, common in early 18thC. 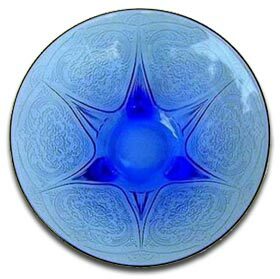 Dark blue lustre art glass developed by the US designer Louis C. tiffany in the late 19thC. It has iridescent gold streaks – supposed to resemble flows of lava – and was originally called volcanic glass. 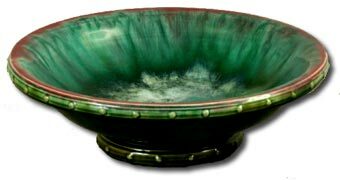 Large vessel of brass, bronze or other metal with one or two spouts, used to hold water for washing hands or feet. 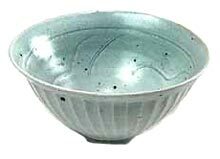 Earliest lavers, orlavabo, date from the 14thC and continued in use until c. 1800. A revolving stand placed in the centre of a dining table and used to hold condiments. Founder of the 20thC art pottery movement. Bernard Leach was born and brought up in the Far East. Bernard Leach joined the Hong Kong and Shanghai Bank, but banking was not for him and in 1906 he enrolled in the London School of Art where he met Henry Lamb. Leach went to Japan to study graphics but was instead captivated by the pottery tradition. He returned to Britain to and founded the St Ives pottery in Cornwall. His own work is greatly influenced by Korean and Japanese forms and glaze. Throughout his life Leach travelled extensively, passing on his knowledge to hundreds of potters around the world. Bernard Leach died in 1979 at the age of 92. Glass containing a high proportion – 25-30 per cent – of lead oxide. Lead glass refracts (bends) the light more than non-lead glass, thus giving extra brilliance. It can be blown more thickly than soda glass and is therefore more suitable for cutting and engraving. The original but incorrect name for English lead crystal is flint glass. The misnomer came about when George ravenscroft, a British manufacturer trying to produce a substitute for Venetian cristallo, used finely ground flints and potash instead of the traditional Venetian sources of silica and soda. These new ingredients led to the formation of fine cracks (grizzling), which was remedied by replacing a proportion of the potash with lead oxide. Founded in Leeds in 1770 by brothers John and Joshua Green in partnership with Richard Humble. Success came with the production of household goods in a variety of ceramic bodies, the most popular being CREAMWARE, a type of earthenware made by several companies from white Cornish Clay with a translucent glaze, producing the pale cream colour from which it took its name. 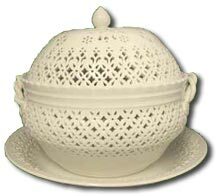 Leeds creamware was widely exported throughout Europe. It is light in weight, and pierced decoration was a speciality. A common Leeds feature is a handle formed of two intertwined strips ending in a relief motif of flowers, leaves or berries. Most was undecorated, but some black transfer-printing and blue-printed or painted and enamelled ware exists. Leeds pottery also produced fine-grained agate, PEARL, LUSTRE and tortoiseshell wares, some fine stoneware and small figures similar to those of Staffordshire potter Ralph wood. Few genuine products carry factory marks, but other factories copied Leeds ware, often using a Leeds mark, in the late 19th and early 20th centuries. Eminent Parisian furniture designer, interior decorator and bookbinder who contributed significantly to art deco style. Most of his furniture was designed in the 1920s. It reflected African and cubist influences and was often incorporated from luxury materials such as ebony, silver, sharkskin and lacquer. German engraver of glass and precious stones, who did much to perfect the technique of wheel engraving. He was given the monopoly on glass engraving throughout the Habsburg Empire. He worked mainly on fragile cristallo glass and trained a number of people who later became eminent engravers, including Johannes Hess and Caspar Schindler. Glass panel in the door of a longcase clock, through which the pendulum may be seen. It is sometimes known as a bull’s eye. British architect and designer of furniture, metalwork and ceramics who influenced the arts and crafts movement. He was principal of London’s Central School of Arts and Crafts 1896-1911, and Professor of Design at London’s Royal College of Art 1900-18. His furniture was mainly rustic and unvarnished, and often decorated with floral marquetry. He also designed pottery for wedgwood. British retail firm established in 1875 by Arthur Lasenby Liberty (1843-1917). The company specialised in imported Moorish, Eastern and Egyptian furniture for resale in Europe, commissioned Art Nouveau designs in fabrics, pottery, silver and pewter, and had a major influence on style in the late 19th and early 20th centuries. Steps for reaching high bookshelves, which came into general use in the libraries of private households in the mid-18thC. Some library steps folded or converted into stools with padded seats or even elbow chairs and were called metamorphic chairs. Extremely hard, oily, dense, dark brown wood from the West Indies – one of the earliest woods to be imported to Britain before 1650. The wood was made into drinking bowls, pestles and mortars, and similar items; the 18thC clockmaker John harrison even used it for the wheels in his early clocks because of its natural lubrication. Lignum vitae was used for oyster parquetry on late 17thC furniture, and in the 18thC for small areas of veneer. Soft, fine-grained, creamy-white European wood. Lime proved a great success with woodcarvers as it cuts well with or across the grain. The master carver Grinling gibbons and his school used it extensively. The Limehouse porcelain manufactory was amongst the very first of the English porcelain production centres, founded in the mid-18th century within a year of Bow and Chelsea. The pothouse was functioning by early 1745, but production was short-lived and it went out of business by early 1748. It was a vital missing link in the early development of English porcelain. Excavations in 1990 revealed a kiln, kiln furniture, as well as both glazed and unglazed wasters, of tableware and miniatures. Analysis showed that the standard of craftsmanship was low. The pothouse went out of business not only because the wares failed to capture a market, but because profits from sales were not enough to cover costs incurred during the initial development period. In its brief period of operation, c1745-8, it became the first British factory to produce blue and white soft-paste porcelain, and possibly the first to add soapstone successfully to the formula for whiteness and plasticity. Teapots and sauceboats, many echoing the silver shapes of the day, and shell-shaped dishes were the main lines. An archaic expression derived from the old English word for illuminating (as in manuscripts), and which is now coming back into use to describe the technique of miniature painting. A major centre for European enamel work production since the 12thC, and French ceramic production since the late 18thC. The Limoges manufactory of hard-paste porcelain was established by Turgot in 1771 and placed under the patronage of the comte d’Artois, brother of Louis XVI. Limoges had been the site of a minor industry producing plain faience earthenwares since the 1730s, but the first identified French source of kaolin and a material similar to petuntse, the ingredients used for the production of hard-paste porcelain similar to Chinese porcelain, were discovered at Saint-Yrieix-la-Perche, near Limoges, in an economically distressed area, and began to be quarried in 1768. The manufactory was purchased by the king in 1784, apparently with the idea of producing hard-paste bodies for decoration at Sèvres. After the french revolution several families of potters established factories in the city which is in Limousin, in central France, including the Franco-American Haviland family. Most production was of domestic wares, often finely transfer-printed botanical designs. Limoges enamel ware is painted on copper predominantly in white, blue and gold on a dark blue or black ground. The enamelling industry declined in the 18thC, but was revived c1820-50 by craftsmen such as Julian Robillarda. Durable textile made from the fibre of the flax plant, which is bleached to improve whiteness and texture. Among the best quality is 15th- 18thC Dutch linen from Haarlem. Linen production declined in the 18thC as the yarn broke easily on a power loom. When the problem was overcome in the late 19thC, cotton had taken over the market. Device for pressing linen, known in various forms from medieval times to the 18thC. It basically consists of two flat boards which can be pressed tightly together (with the linen between) by means of a spiral screw. A term for a cupboard for the storage of linen, normally with sliding trays enclosed by doors with drawers below. Glass object used for pressing linen in the 18thC. The vertical handle projecting from the middle of the heavy, circular base is often ribbed to give a better grip. In Britain, linen smoothers were also known as slickers, slick stones or smoothing irons. Style of woodcarving, especially on panelling, to resemble hanging folds of fabric. Glass container, often blue, that fits snugly inside metal objects such as sugar basins and salt cellars. The glass lining prevents the contents corroding the metal and perhaps being contaminated by it. Blue glass also helps to show off any pierced decoration on the metal container. (1729-96) Furniture designer and cabinet-maker. Linnell’s early chinoiserie pieces included Rococo-style beds and sofas. His later furniture was designed to fit the interiors of houses by architects Robert Adam and Henry holland, among others, and became increasingly influenced by the neoclassical style. British studio pottery, near middlesbrough, yorkshire. Established in 1879 by John Harrison, a local entrepreneur and Christopher Dresser, an important designer of the time, the pottery went on to produce over 2000 different shapes of ceramic ware in its short 10 year life. The pottery produced decorative wares, including teapots, distinguished by simple lines, thick richly coloured glazes often with Japanese or Peruvian influences. Later wares used slips and sgraffito as decorative techniques. Today Linthorpe pottery is highly collectable. It is very popular locally, but is also known and respected world-wide. Its distinctive mark has made it easily recognizable. French for ‘boat-shaped bed’ – an Empire-style bed with curving head and footboards, often forming S-shaped scrolls. Thin, translucent porcelain panels or plaques that on being held to the light reveal a picture or design with a three-dimensional effect. Lithophanes were usually made of unglazed, biscuit porcelain, and were set into lampshades and lanterns, hung in windows or moulded into the base of mugs. A wax master of the design was modelled from which a plaster mould was made as a cast for the porcelain paste. Subjects were typically on religious themes or based on paintings. The process was invented in France in 1827 and taken up on a large scale at meissen and berlin 1830-50, and also at minton, belleek and worcester. An opaque or translucent marbled glass with a surface resembling polished gemstones in a wide range of colours. 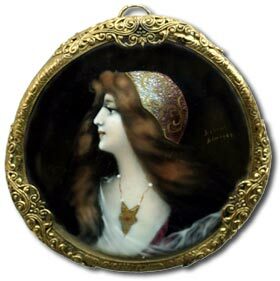 It was first made by the Bohemian glass artist Friedrich Egermann in 1829, and was copied by other Bohemian and French manufacturers, sometimes with engraved, cut or painted decoration. Centre for ceramics from 1710 producing tin-glazed earthenware. Specialities of the period were blue-painted punchbowls, and tiles transfer-printed in black or red with contemporary subjects and characters. From the 1780s, cream ware was the main output, decorated in cobalt blue, enamel colours, or with blue or black transfer-printed designs. A number of porcelain factories sprang up in Liverpool, such as Gilbody (1754-61), Chaffers (1754-65), Philip Christian (est.1765) and, in the final decades of the 18thC, Pennington. The history of Liverpool porcelain is still incomplete; fluctuations in the make-up of the porcelain paste and cross-fertilisation of designs between the factories, make identification very difficult without chemical analysis. 16th and 17thC term for a servant’s bed. Until the last decades of the 19thC, this would be simply a straw-stuffed mattress lying on a wooden pallet. 15th to 17thC cupboard. It was used for storing food and drink and sometimes rested upon a stand known as a livery board, which doubled as a bench. Patent name for a tough material woven from wires covered in machine-twisted paper so as to resemble wicker. It was popular in the 1920s and 30s, for linen baskets, chairs and small tables. A filler such as pitch or resin used to add density and weight to a hollow article made from a thin sheet of metal such as a silver candlestick. Rounded decoration which projects horizontally, as on the rim of a plate or dish, or vertically as on the cover of a tureen. Glassworks in Vienna, Austria, that achieved an international reputation from 1864 under the leadership of Ludwig Lobmeyr. The company produced fine cut and engraved glass and iridescent art NOUveau glass until c1900. (1740-69) Master carver and Rococo-style furniture designer. Lock published several influential books of his designs, and his carving featured natural themes and Rococo shells and scrolls. He is believed to have been employed by Thomas chippendale. Attenuated figure of a Chinese woman seen as a decoration on 18thC Chinese porcelain, some Dutch and English delftware, and on worcester porcelain of the 1760s. The name comes from the Dutch Lange Leizen. Tall, narrow, floorstanding clock, also known as a grandfather clock. The case protected the pendulum, and was introduced soon after its invention in 1657. The clocks were produced from the 18thC until c. 1820 in London, c.1845 in the provinces, and revived c.1880-1910. See: Buying Longcase Clocks – Five Things You Need To Know. Probably one of the first Staffordshire producers of soft-paste porcelain. In its decade of operation (1750-60), distinctive wares included dishes, sauceboats and tureens moulded in the form of overlapping leaves, and what came to be known as ‘Snowmen’ figures -because of their poorly defined features and unpainted but thickly glazed bodies. Although many later figures were based on meissen designs, some were original and notable for their exuberance of form and fresh colours (such as a vivid yellow-green) based on those used for salt-glazed stoneware. 19thC oval tilt-top table supported on a central pillar, designed for an early 19thC card game called lanterloo or loo. (1870-1933) Austrian Modernist architect who was an early practitioner of functionalism and industrial design that emphasised practicality and minimal decoration. After working briefly with the architect Frank Lloyd wright in the USA, Loos settled in Vienna where he produced several documents, including Ornament und Verbrechen (Ornament and Crime), denouncing the use of ornament. He designed simple furniture in strong, vigorous shapes, and glassware for the Viennese firm J. & L. lobmeyr. Sliding wooden rails that support the desk panel of a bureau or the leaf of an open folding table. Method of casting metal or glass objects, used since ancient times, which achieves greater definition than straightforward mould-casting methods. It is also known by its French name of cire perdue. A plaster cast is made of the original model that is to be reproduced. When set, this plaster mould is separated into several pieces and the original model removed. The inside of the mould is coated with wax to the required thickness of the finished article. For hollow objects, the central cavity of the mould is filled with clay and the mould is reassembled. The whole lot is heated to melt the wax so that it drains, or is ‘lost’, through holes in the mould. The space left by the wax is then filled with the molten material. When cool, the mould is separated and the clay core removed leaving a replica in the new material. Most lost-wax processes use flexible rubber moulds which can be easily removed and reused, and investment casting in which metal is forced into the mould centrifugally. Carpets with a distinctive geometrical pattern of alternating rows of octagons and crosses made up of stylised foliage. Motifs are invariably in yellow with blue details on a red ground. They are named after the 16thC Italian painter Lorenzo Lotto who in fact depicted a far wider range of designs in his paintings. ‘Lotto’ carpets were made throughout the 16th, 17thand 18th centuries; most are thought to come from the Ushak region of western anatolia. Later examples tend to be coarser in style. (1783-1843) Landscape gardener, architect and author, best known for his comprehensive Encyclopaedia of Cottage, Farm, and Villa Architecture and Furniture, published 1833. It was used as a pattern book by builders and furniture-makers throughout the Victorian period. An extravagant style prevalent in France during the reign of King Louis Phillipe (1830-48). It featured flamboyant curves and heavy ornamentation including enamel plaques, bronze mounts and marquetry. The style followed on from the empire style of Napoleonic times. The style inspired by the Court of the ‘Sun King’, Louis XIV (reigned 1643-1715) and his palace at Versailles, which made France the leading influence in European decorative arts. It coincided with the puritan, restoration, william and mary and queen anne periods in Britain. Louis XIV style was opulent baroque modified by Classical lines, and marked by flamboyant craftsmanship. Cabinet-making was notable for fine veneers and intricate marquetry, with lavish expenditure on materials such as pietre dure, exotic woods, tortoiseshell, lacquer work and even precious metals. In ceramics, it was the time of radiating lambrequin designs at rouen potteries and chinoiserie vases at nevers. The king encouraged industries such as these with generous financial incentives. Louis XIV style spread throughout Europe, aided by a flourishing export trade, and the dispersal, to Britain, Holland and Germany in particular, of skilled French huguenot craftsmen after 1685. The height of the frivolous excesses of Rococo style in France, roughly covering the period 1720-50, although the king continued to reign until 1774. Although the style had a less wide-ranging impact on fashions elsewhere in Europe, it is notable for some of the finest gobelins tapestries, delicately painted chantilly and marseilles faience and sevres porcelain, and the high-legged commode with serpentine front and ormolu ornament. A French style which coincided with the late Georgian period in Britain. Its main characteristic – a Classical reaction against the fussiness of Rococo style -actually predated King Louis XVI’s accession to the throne in 1774 by 20 years. The Classical influence gave the style its contemporary 1760s name of goût Grec (Greek taste). Small settee or wide armchair popular from the late 17thC in Europe. Love seats were just wide enough to seat two people in intimate proximity. Love seats are also known as courting chairs and the French version as marquise chairs. Term for a small, elegant side or dressing table of the late 17th and early 18th centuries, usually with two deep drawers flanking a short central drawer. A Suffolk pottery operating c.1757-1802, and making soft-paste porcelain, mostly for the local market. Its output included commemorative souvenirs, tablewares decorated with the words ‘A Trifle from Lowestoft’ and naive Chinese-influenced landscapes. In the 1770s, an anonymous painter produced memorable tulip designs, often featuring a fully blown bloom. ‘Lowestoft’ was also a misleading name given to what is now described as chinese export porcelain, possibly because the Chinese wares were unloaded at the port. Derived from the French word lune (moon), applied to a semicircular decoration either carved or inlaid on furniture or incorporated into a textile design. Glass or crystal drop, either smooth or faceted, used to decorate light fittings, as on a chandelier, and ornamental glasswares. Also: Vase with crystal drops hanging from the rim, 19thC English style. Pottery with an iridescent or metallic finish. A metal oxide is dusted or painted on the glaze and fired in a reduced atmosphere, converting the oxide back to metal. Gold, silver, copper and metallic pink, purple and dark red are the most common pigments. Lustre finishes are a characteristic technique of hispano-moresque ware, and of some Italian maiolica. In the 18thC meissen used a lustre technique developed by Böttger and known as Böttger lustre or Perlmutter (mother-of-pearl). Towards the end of the 19thC, they were adopted by British studio potters such as Bernard moore and at William de morgan’s Fulham factory. A glossed silk fabric with a ribbed pattern, used from the 14th to 16th centuries. It applied specifically in the 17thC to a form of taffeta which was stretched and then coated with a glossy gum. Lutestring or lustring was used in the 17th and 18th centuries particularly as a dress fabric and for bed and window curtains. 18thC drinking glasses, tumblers and decanters attributed to glass houses in King’s Lynn, Norfolk. The vessels are decorated with horizontal ribbing.